In three weeks Valentines day will be upon us so plan ahead to ensure a wonderful experience to remember forever. This year more than 20 wineries will be extending their Valentine's Day weekend through Monday, which is also President's Day. 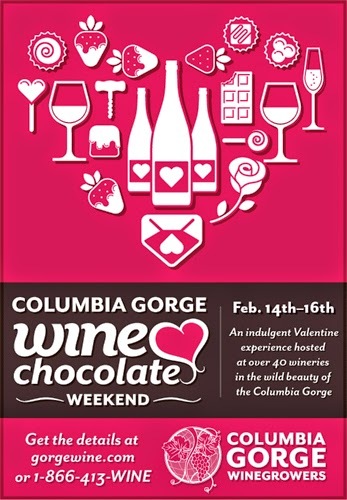 This is great new because you have more time to enjoy the Columbia Gorge Wine and Chocolate Valentines Weekend, which offers many discounts on wines, lodging and provides many wine tastings. Get swept away for the weekend in the beautiful Columbia Gorge Wine and Chocolate Valentine’s Weekend February 14th - February 16th. Read about what specific wineries will be providing for this big weekend below. “We will be celebrating our new tasting room and the official release of our 2011 Merlot on this very special occasion,” John Haw, winemaker at Jacob Williams Winery, said in a news release. Also, Mt. Hood Winery will be releasing their much anticipated 2013 Pinot Noir paired with chocolate dipped fruits. Discounted accommodations are being offered for lodging at partner properties all along the 40-mile corridor that makes up the Columbia River Gorge wine country. The luxurious Columbia Cliff Villas are offering a special package for the weekend that includes discounts of up to 50 percent on room rates.